Jagadguru Kripalu Chikitsalaya, Banara - a free Allopathic charitable hospital was inaugurated and opened to the public on the 4th of May, 2013 as part of the Jagadguru Kripalu University project. Situated in pristine surroundings & inside the Jagadguru Kripalu University Campus, the allopathic medical center provides completely free facilities for over 10,000 villagers in and around village Banara. At JKC a well-equipped vision centre is established for diagnosis of common ophthalmic problems and providing immense relief to villagers living in the vicinity. 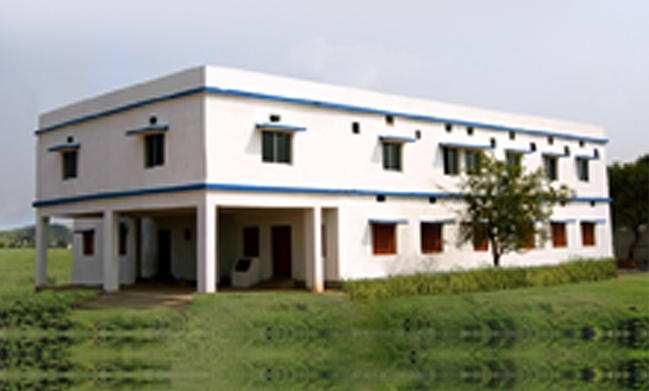 JKC Banara was established by the Jagadguru Kripalu Yog Trust (JKYT). The trust works for the physical, mental, intellectual and spiritual wellbeing of the people. JKYT has a number of congregational centers and thousands of supporters in many states of India. It is a sister and subsidiary organization of the Jagadguru Kripalu Parishat (JKP), which oversees the activities of the worldwide mission of Jagadguru Shree Kripaluji Maharaj. Location : Village – Banara, Tehsil – Damapada, District – Cuttack, Odisha, India. The village of Banara has a population of around 5000 people. A majority of the villagers belong to the social and economically backward castes. There are no medical facilities within five kilometers of the village. Catchment area of the hospital is around 3 km in radius, with a catchment population of more than 5,000. Further, the entire Dampada Tehsil consisting of many villages are benefitting from the project. Land:The hospital is situated on 2 acres of land. It is a portion of the 100 acres of land that were purchased from the Govt of Odisha for the construction of the Jagadguru Kripalu University. To give the gift of health and well being to the socially & economically backward people of village and the neighboring areas. To provide out-patient , in-patient and emergency medical & surgical facilities, along with modern diagnostic services to the patients. To education the masses about maternal health care, including family planning, prevention and control of locally endemic diseases, safe health practices and basic sanitation etc. Emergency Facilities: The Hospital has basic emergency facilities in the Casualty Ward. Operation facilities are also available, and an ambulance is available for severe emergencies and to transport patients to metropolitan hospitals. A doctor will be available 24 hours a day, seven days a week at the hospital. Medicines: The Hospital has a 24-hour Pharmacy, where all medicines are available at subsidized rates. Diagnostics & Examinations: The Hospital is equipped with a modern analog X-Ray Machine (Seimens MultixPro), capable of giving accurate and precise scans, and a professional ECG machine. The Hospital is also equipped with a Modern Pathology Lab with latest equipments for Lab Testing and Diagnostics. JKC is are delighted and privileged to announce the inauguration of our Fist Vision Centre (VC) – Free Eye Testing Centre – in Odisha, Banara VC, India in association with LV Prasad Eye Institute (LVPEI) Network at Jagadguru Kripalu Chikitsalay (JKC) part of the JK University project at Banara, Cuttack. The vision center is equipped with all the basic instruments for optometric diagnosis of common ophthalmic problems and provides immense relief to over 8000 villagers who live in the vicinity of JK University. The center serves as primary eye disease screening & treatment center at Banara. The vision care center aids the hospital in diagnosing and treating common eye problems like Cataract, Myopia, Glaucoma, etc. The center is also equipped for minor surgery and post operation treatment. Consultation and eye testing will be free of cost. The Hospital will continue to expand, and the top floor rooms that have already been constructed will be utilized. The expansion will depend upon the needs, as per requirements. Also, residential quarters for Doctors and Nurses are under construction, close to the hospital premises. To be commissioned for hospital use in future, as per need. 1. In the first stage, the hospital is functioning as an out-patient facility, recognized as a dispensary by the Govt. of Health and Family Welfare Dept. 2. In the second stage, indoor facilities and emergency facilities have been provided. A minor OT has been commissioned. 3. In the third stage, which is to be implemented, major operative procedures and ophthalmic procedures will be conducted. Capacity of Admissions and Intake: The catchment area of the hospital is around 10 kms, with a population of more than 10,000 living in the surrounding villages. The Hospital is presently run with an OPD (out-patient department) section with diagnostics and a pharmacy. A minor OT has also been commissioned. Over the next few months, a dedicated in-patient facility with over 25 beds capacity will be commissioned, based on the needs of the villagers.